A tranquil, rural setting, set on a well maintained 10 acre property. 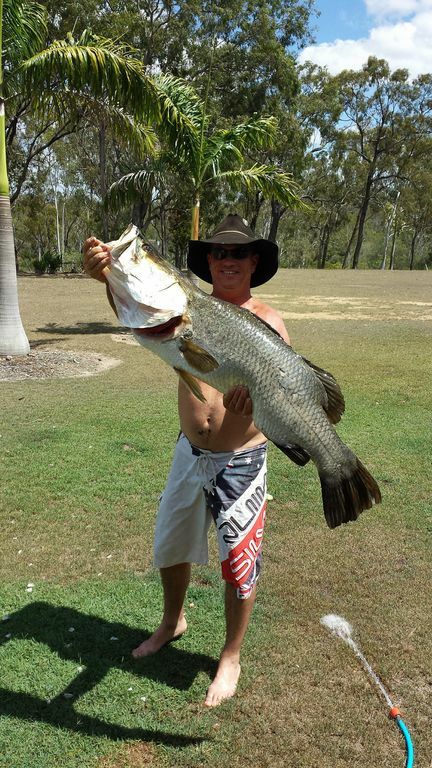 Great barramundi fishing at your doorstep, lots of room for the kids and dogs to run around while you enjoy a beverage on the pergola overlooking the creek. (Tea and coffee provided). Great swimming and kayaking. This property is ideally located with the beautiful Lake Awoonga, Tannum Sands beach and the shopping precinct all within a 20 minute drive. Plenty of parking space for cars and boats. Take a stroll around the mango orchid, pick your own mangoes in mango season, December to February. The house is a large 4 bedroom home and sleeps 8 people, it has a small fenced yard adjoining the house so your furry friends are close by. Limited mobile phone reception, access to neighbouring landline for emergencies. Washing machine and clothes line. Pegs supplied. The house is quite roomy with an exception to the toilet, the door closes close to the toilet. Great place...our dog Harvey thought so as well. Hosts were fantastic and catered for your enjoyment. Place was clean and tidy and in a peaceful rural setting. Would love to get back there again. Thanks guys. I was very happy with chris, catherine and their dog, harvey. Chris requested for the dog to be inside and i agreed. There was absolutely no sign of a dog being inside, so thanks for that. Friendly, quiet and tidy. Wonderful spot- we stayed with friends, 8 all up. Beautiful outlook, well maintained house great fire pit and room for us all. Would definetly return. I was very happy with Rachel's group of 8, was nice to see them enjoying the property, fire etc. After a full weeks stay the house was left lovely. I would definately recommend Rachel. The owner and operator was very friendly and warm. The house was in great condition. The accommodated for children was above and beyond. Plenty of small things that made the stay well worth it and we will be staying again. It was a pleasure having Carol and her group, very relaxed guests who didnt complain about the little things. They were very respectful of our house and property, and the house was left very clean, Carol even remade one of the beds from guests that left early. Thankyou for your stay, we look forward to having you visit again. Peaceful clean house with a great outlook over the river not too far from the highway definitely worth an extra ten minute drive if your planning a stopover on the highway as we did or for a longer getaway would be great too!